A Norwegian team who built a Viking long ship using 1000-year-old techniques has successfully crossed the Atlantic ocean, up the St. Lawrence River and into eastern Ontario to prove that Vikings may have come further in land than Newfoundland. A 32-metre long oak ship built using ancient Norse methods has sailed across the Atlantic and up the St. Lawrence River to Brockville, Ont. to demonstrate that Viking explorers may have travelled farther into North America than previously thought. 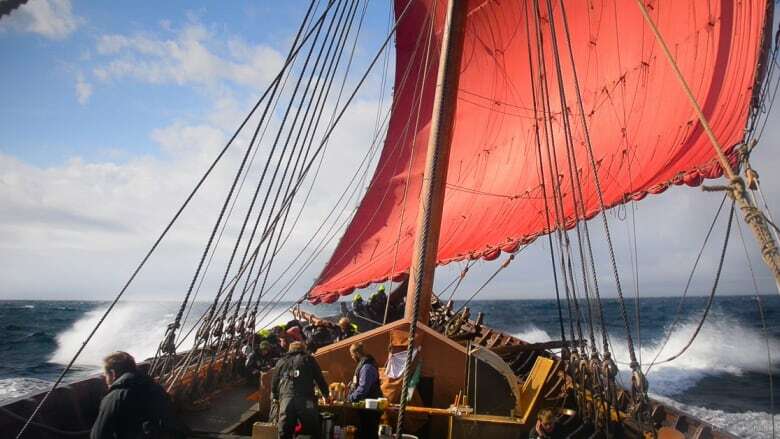 The Draken Harald Hårfagre set sail from Haugesund, Norway on April 24 with a crew of 32 volunteer sailors working in four-hour shifts. Because a Viking long ship has no "below deck," 16 sailors at a time sleep under a tent below the 260 square metre red sail when not setting rigging, cleaning, preparing food, or manning the 25 pairs of oars. The Draken Harald is called the world's largest Viking ship, complete with a carved dragon figurehead at the prow and elaborate ornamentation throughout. It crossed from Norway to Reykjavik, Iceland in late April, then to Qaqortoq, Greenland, reaching St. Anthony, N.L. in June. Björn Ahlander, captain of the Draken Harald, said the aim of the expedition is to explore and relive one of the most mythological sea voyages – the first transatlantic crossing, and the Viking discovery of the so-called "New World." 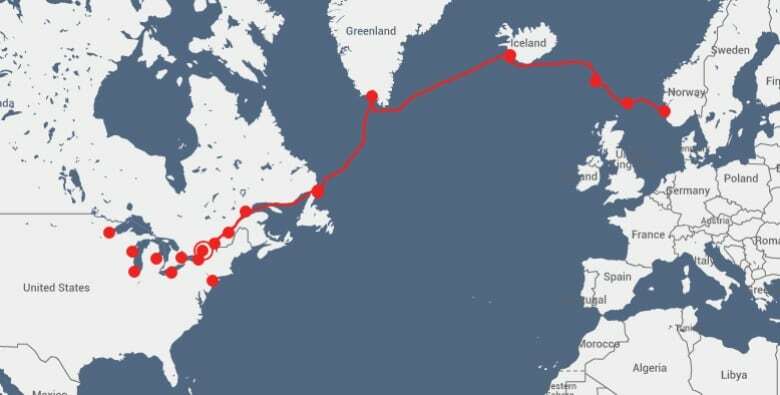 The ship sailed from Norway in April, eventually reaching Newfoundland in June. (Draken Harald)Ahlander said his ship's arrival, about 1,000 years after Norse sagas tell of Leif Erikson's landfall in Newfoundland, has been friendly. "'It has been fantastic, everybody gives us gifts, everybody is so interested in our voyage," said Ahlander. Ahlander said part of the purpose of the expedition was to test whether Vikings might have sailed farther than L'Anse aux Meadows, Newfoundland, where archaeologists in 1960 discovered remains of a Viking settlement dating back more than a millennium. Vikings on the St. Lawrence? "The Vikings could have been further into this continent," said Ahlander, who has studied the seafaring adventurers of Erikson, the Icelandic explorer believed to have reached "Vinland," or North America, in the year 1000. "The main purpose, from the sagas and the stories, is that they were in real need of wood, trees, timber. That's why they discovered places in Newfoundland," said Ahlander. 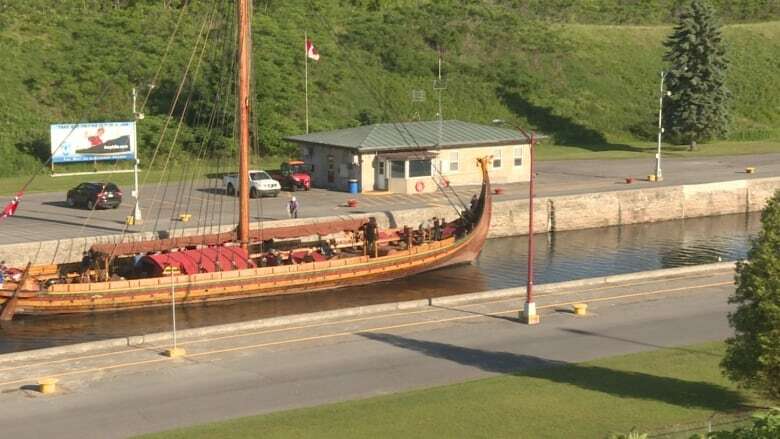 The Draken Harald arrived at the Iroquois lock on Thursday. (Stu Mills/CBC)"But here should be a much better place to create a settlement of course." 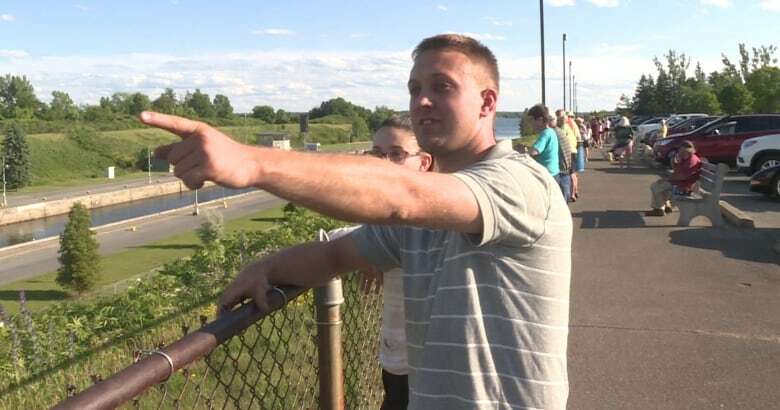 he added, gesturing from his boat toward the St. Lawrence River shoreline near Morrisburg. "There's lots of wood everywhere, and warmer, and better." Researchers have used satellite images to try to pinpoint the location of Hóp, a place in Vinland referred to in the sagas of Erikson, according to Ahlander. "(Hóp) was further in the country. Where that is, no one really knows. But I (will) try to find it now," he said. "I'd say it was quite possible," said Brian Peck, watching the ship pass through the lock at Iroquois, west of Morrisburg. "We seem to underestimate what the ancients were capable of. It's just to find the remains of one, to prove it." "It smells of timber and old tar rope," said Richard Winnel, the commercial pilot hired to help the long ship navigate the lock. Brian Peck watched the Viking long ship arrive at the Iroquois lock on the St. Lawrence Seaway. (Stu Mills/CBC)Winnel said the captain explained the mission of the crew's North American expedition, and showed video of the passage from Greenland to Newfoundland. The ship will be docked in Brockville for the weekend, before continuing on to Toronto.